Clothes Moth Control acts to deter-The Webbing Moth Larvae & The Case-Making Moth Larvae from destroying your rugs. The webbing moth (Tineola Bisselliella) and the case-making moth (Tinea Pellionella) look very much alike. Both adult moth species are buff or tan in color and have a wingspan of about 1/2 inch. Both species are poor flyers and are adverse to bright light. 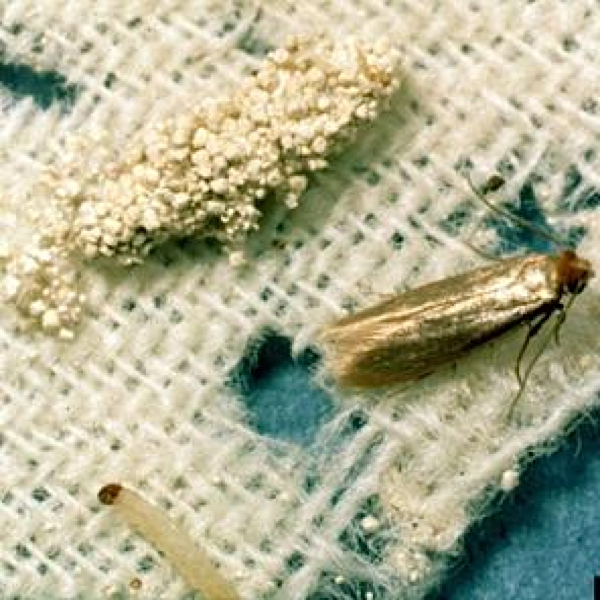 Female clothes moths lay from 200 to 300 tiny eggs on the preferred textile upon which the developing larvae will feed- wool.The egg-hatching period for these moths is about four to eight days but may take longer in cold temperatures. The webbing moth spins a silky coverlet, under which the white-bodied, dark headed larvae feed and then pupate at the conclusion of the feeding period. Their life cycle is variable, extending from three months to a year. The case-making moth larvae construct a small portable case of the woolen material that it feeds upon. The case enlarges and is dragged about as the larvae feeds. After the feeding stage has concluded, the larva becomes attached to the case, where it will pupate, in a dark, secluded place. The length of life cycle of the case-making moth is extremely variable, the life cycle based on food supply, temperature and humidity. It can last two months to four years! Vacuum rugs regularly, especially under furniture and it dark rooms, inspect all rugs that are in dimly lighted areas for evidence of casings or the larva,have your rugs professionally cleaned when needed and have a moth repellant applied after the rug is cleaned. Four species of small, oval shaped beetles, may be either solid black or mottled with white, brown, yellow or black. The larvae have gold, brown or black bristles terminating in a tuft of long hairs and grow to be 1/4 to 1/2 inch long, depending on the species. As opposed to the webbing moth & case making moths adult carpet beetle are good flyers and can enter the home through open doors & windows. Their destructive larvae may be deposited either as eggs by the adult females or carried into homes on already infested items. As with any destructive insect, a significant infestation may require the use of foggers or fumigation by a professional exterminator. Although the adult beetles – also known as Buffalo Moths – feed on pollen and vegetable matter, larvae feast on wool, hair and fur. Other delightful foods include dog and cat food, leather, bookbindings, dead insects, cotton, linen, rayon, and jute, especially when stained with spilled food and animal excreta. The beetle larvae cause the damage, crawling from room to room and living behind baseboards and molding, and in heating system air ducts, dresser drawers, carpets, clothing and furniture. Feeding damage often occurs under heavy furniture or pianos and at carpet edges. Adult beetles fly readily in May and June. They are attracted to night-lights, and may enter through an open window or door. Some may be brought in accidentally on cut flowers or in furniture that has been in storage. 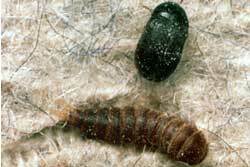 All carpet beetles pass through the egg, larva, pupa and adult stages. Adults fly readily and during warm, sunny days feed outdoors on flower pollen of spirea, dogwood, crepe myrtle and buckwheat that have white or cream-colored flowers. Others feed on daisies, wild asters, etc. Adults are attracted by light, fly into homes and may be found on windows and screens. Depending on the species, each female can lay up to 100 white eggs or more that hatch in 8 to 15 days in warm weather. Eggs laid indoors occur in lint accumulations near the food source, in air ducts, under heavy furniture, underneath baseboards, etc. After hatching, larvae begin their destructive feeding, avoiding light, and molting several times as they develop. Sixty days to a year or more may be spent in the larval stage feeding, depending on food and temperature. Some life cycles are two to three years, depending on the species of carpet beetle. Inspection- Locate the source of infestation before treatment. Carpet beetle larvae prefer to feed in dark, undisturbed, protected places. Use a flashlight and nail file to check in such places as under baseboards, in and under upholstered furniture, piano felts, air ducts, stuffed animal trophies, stored cereals, bird nests under eaves, rodent nests, wasp nests in attics, dead birds or rodents in wall voids, woolens, clothes closets, furs, etc. Often the cast skins are more abundant than the larvae. Adult beetles flying around windows may help in locating the infestation. Prevention- Good housekeeping is critical. Use a strong suction vacuum cleaner with proper attachments to remove lint, hair and dust from floors, shelves and drawers. Periodically brush, air outside, or dry-clean furs, woolens, blankets, etc. Clean rugs, carpets, draperies, furniture, baseboards, air vents, moldings and other hard-to-reach places regularly. If rugs are to be stored for any extended length of time, they should first be cleaned and then mothproofed. Para-dichlorobenzine or naphthalene moth crystals or moth balls are very dangerous to your health and should be avoided (assuming that PDB actually helps prevent moth infestation). These chemicals have been linked to increased fluid pressure within the eyes, anemia and liver damage. Clearly, the odor from PDB never seems to diminish completely. Each rug should be then wrapped in paper rather than plastic as the latter does little to keep out rodents and could possibly cause condensation to form within the package (very slight probability but possible nonetheless). The rugs should be placed in an area safe from moisture or other harm, away from the walls and off the floor. Cedar lined closets and chests should not be relied upon for complete protection from destructive insects. Also there seems to be only anecdotal evidence supporting such preventatives as newsprint, bay leaves or pepper. Concern about insect damage should not be limited to stored rugs. 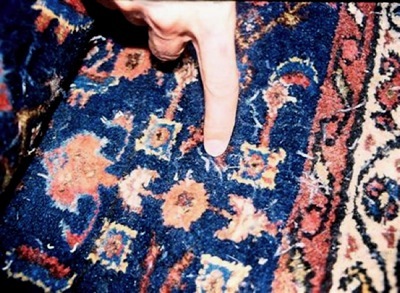 Rugs kept in rooms with little traffic or daylight or with portions of carpets that extend under furniture are also subject to moth and beetle infestation. Rugs and weaving that are hanging on walls are particularly susceptible to insect infestation. Even actively used rooms can harbor hordes of destructive insects if they or their food source remain undisturbed. Under ideal conditions, rugs can suffer extensive damage in a surprisingly short time. If damage or evidence of infestation is discovered on your rugs, send your rugs to us to be cleaned and treated with our moth-repel/carpet beetle solution.